So I’m currently about halfway through Gene Wolfe’s The Book of the New Sun series, a “dying earth” style tetralogy which has been described as both science fiction and fantasy and has won awards in both categories. Whether or not the series is science fiction or fantasy is a good question, but simply trying to decipher the answer raised a new question: can a story be both science fiction and fantasy, or are the two mutually exclusive categories? To answer that question we must first define science fiction and fantasy, which we can do with a little aid from Wikipedia and the internet. The traditional definition of science fiction is a genre that encompasses stories with speculative elements that are at least scientifically plausible, if not necessarily scientifically possible. What does this mean? Well, if we ask ourselves if a story is possible based on our current understanding of science and the laws of nature and the answer is yes, then that story would be considered science fiction. – Space travel: We know this to be possible, the only question is how we could travel long distances through space. – Aliens: Given that mankind exists, and that we can extrapolate from current data that there are probably trillions of planets in our galaxy alone, then it is likely that alien life forms do exist. – Sentient computers/robots: Not a far leap considering computational advances over the last 60 years. Other common elements of science fiction include teleportation, advanced weaponry, genetic modifications, and more. Essentially, as long as science does not indicate that something is impossible, then it can be considered science fiction. Fantasy stories, on the other hand, feature elements of the impossible like magic and supernatural creatures, including vampires, dragons, and trolls. While there are other important differences between science fiction and fantasy genres, including thematic elements, story structure, and accepted tropes, at its core, science fiction is possible, whereas fantasy is impossible. However, this definition falls short, and the reason why is a matter of perspective. 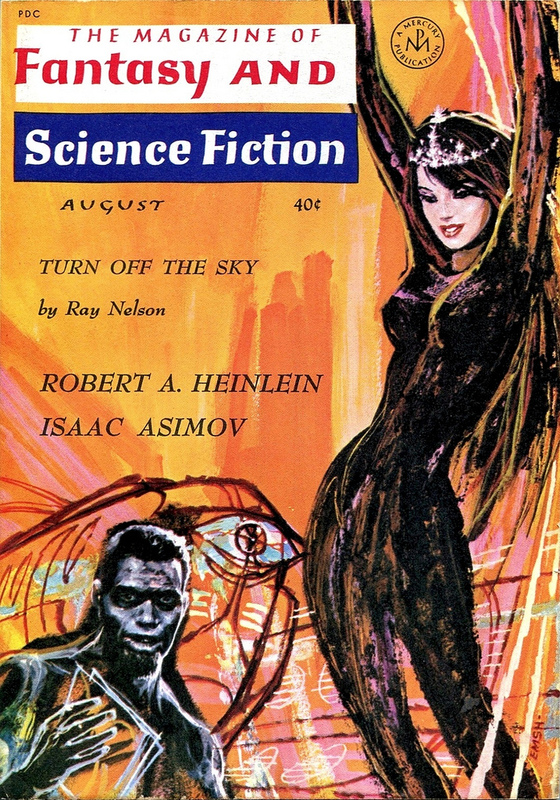 Cover of the Magazine of Fantasy and Science Fiction, which published both genres, though not necessarily simultaneously. There is a famous quote by Arthur C. Clarke in which he stated that “any sufficiently advanced technology is indistinguishable from magic.” I’ve seen people argue vehemently against this, stating that either something is technological in nature or it isn’t. This is true – simply because someone does not understand how something works does not make it magic. However, Clarke was an author, and his quote is referring to stories. You see, stories we read are told from particular perspectives, and from a single, uneducated perspective, technology and magic can be indistinguishable. Imagine a story about technology written by two different people, one who believes in magic and one who does not. The individual who believes in magic will tell a very different story than the one who understands the inner workings of technology. So, whether or not a story is science fiction or fantasy is not dependent upon whether or not the fundamental story elements of a story are possible or impossible, but rather whether the individual telling the story (either first person or third person) believes the events taking place to be possible or impossible, or more accurately, whether the narrator understands technology or believes in magic. It’s a subtle difference, but an important one. So going back to The Book of the New Sun, is it science fiction or fantasy? We simply have to look at the narrator, Severian. As it turns out, he has no knowledge of science or technology whatsoever, and so the story comes across as fantasy, even if it is set in a plausible* future earth scenario. Of course, The Book of the New Sun is an interesting case, because it’s not traditional fantasy either. Given Gene Wolfe’s rather unique literary voice, reading the books feels more like embarking on a peyote smoke-induced fever dream than reading a fantastic tale, but given a choice between sci-fi and fantasy, fantasy gets the nod. *Honestly, the story is not plausible. It’s totally bonkers, but some elements of what Wolfe throws at the reader are certainly based in technology. Image credit: Featured image by DanilLovesFood (http://danillovesfood.deviantart.com/) (CC BY-NC-ND 3.0), via deviantART. Post image by Steve (alittleblackegg) (CC BY-NC-SA 2.0), via Flickr.